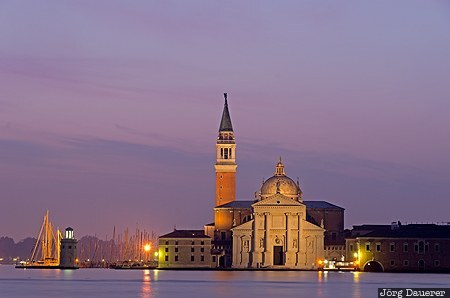 The flood-lit Benedictine church San Giorgio Maggiore on the island of the same name in Venice at the blue hour before sunrise. Venice is in Veneto in northern Italy. This photo was taken in the morning of a sunny day in November of 2011. This photo was taken with a digital camera.